SOLIDWORKS® ScanTo3D is a utility for converting scanned data into solid models and works in conjunction with 3D Scanners. Have you ever wanted to capture a digital rendition of a physical part or concept in SOLIDWORKS® software? SOLIDWORKS ScanTo3D now makes this possible, reducing the time and resources required to build complex CAD models. Unlike using calipers or outsourcing, ScanTo3D allows you to quickly create 3D renderings from scanned data. And as part of SOLIDWORKS Professional and SOLIDWORKS Premium, ScanTo3D is completely integrated into your SOLIDWORKS environment. ScanTo3D is an indispensable tool for any designer who needs to capture physical concept models, existing OEM parts, or anatomical objects and use these scanned renditions to build SOLIDWORKS models. With ScanTo3D, you can easily convert extremely organic shapes to solid models. Plus, ScanTo3D can recognize analytic shapes, such as machined parts and consumer products, and can decompose and fit analytic or non-analytic surface types to the mesh. ScanTo3D can import Mesh and Cloud Point file types including: .xml, .3ds, .obj, .stl, .ply, .xyz, .asc, .vda, .igs. SOLIDWORKS ScanTo3D enables you to open scan data directly into SOLIDWORKS, as well as prepare and surface the data using the ScanTo3D tools. A 3D scanner captures physical samples and brings them into SOLIDWORKS as highly accurate 3D references. Allowing you to scan detailed parts and models and build your designs to match. Combined a scanner with ScanTo3D and you have an affordable, easy-to-use solution for capturing physical objects right from your desktop — no more measuring with calipers or waiting days for expensive service bureaus. Simple-to-use wizards guide you through the process of preparing the cloud point or mesh data and then extracting surfaces from the prepared mesh. Until now, you could only get this type of functionality with expensive software packages and extensive training. But with ScanTo3D, capturing physical data is affordable and easy to do. SOLIDWORKS ScanTo3D is accessible right from within the SOLIDWORKS interface. All functions of ScanTo3D use the familiar SOLIDWORKS Window and PropertyManager to walk you step by step through the process of converting scanned data to a solid model. With the Import capabilities, you can: Open cloud point or mesh data directly into SOLIDWORKS, dynamically section the mesh, and model directly against it using 2D and 3D sketch geometry. With the Mesh Preparation wizard you can: Convert cloud point data to mesh data automatically, realign, remove noise, delete extraneous data, and smooth mesh data. With the Surface wizard you can: Convert the mesh automatically to a solid model in one step using the Automatic Creation option – or you can choose the Guide Creation option, create submeshes, and automatically fit surfaces to the submeshes. The SOLIDWORKS ScanTo3D Add-in is part of the SOLIDWORKS Premium software bundle from Javelin. 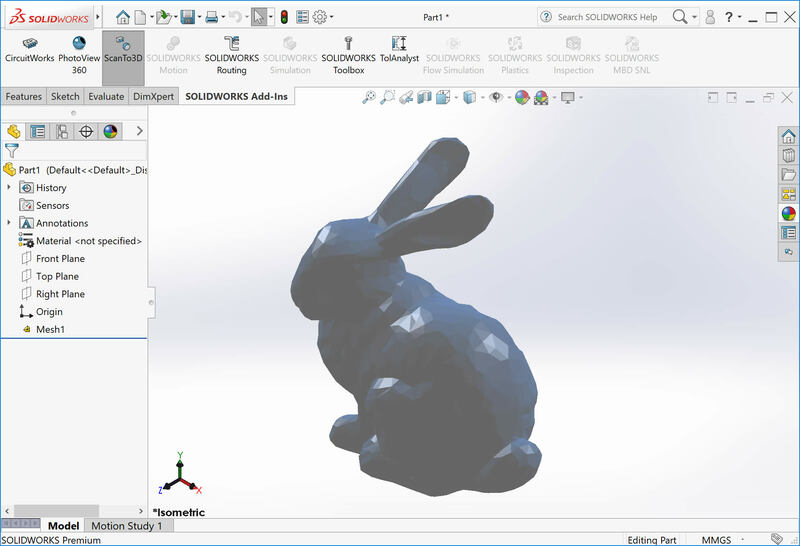 Interested in the SOLIDWORKS ScanTo3D Add-in?